DIE Veneris, 20 die Decembris. Message from H. C. to return a Bill. Speaker of H. C. Speech. A Message was brought from the House of Commons, [ (fn. 1) by Mr. 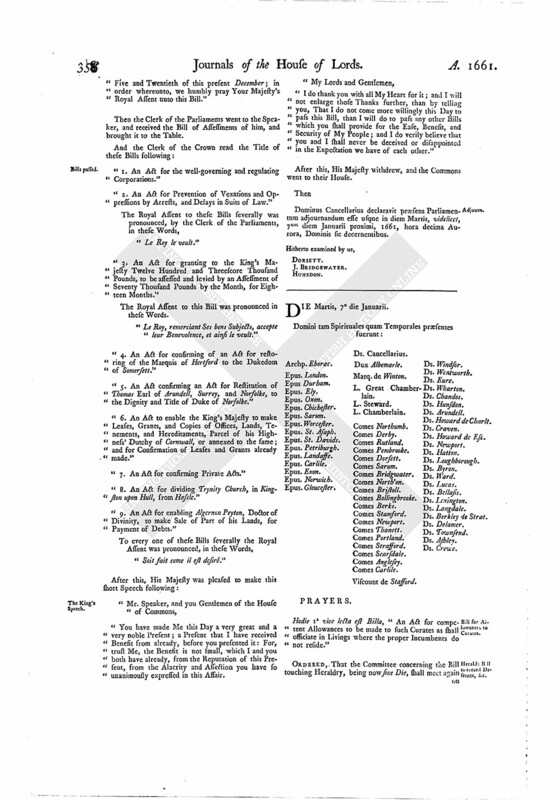 Solicitor General and others;] who returned a Bill sent down to the Commons, intituled, "An Act for Prevention of Vexations and Oppressions by Arrests and Delays in Suits of Law;" to which the Commons have agreed, without any Alterations. The last Time the Knights, Citizens, and Burgesses of the Commons House of Parliament, had the Honour to wait upon You in this Place, Your Majesty was graciously pleased to congratulate with them, for the glorious Meeting of the Lords Spiritual and Temporal and Commons of England, in this Your full, free, and legal Parliament. Great Sir, It is our present Comfort, and will be our future Glory, that God hath made us instrumental for the Repairs of those Breaches which the worst of Times had made upon the best of Governments: The late great Eclipse in our Horizon, occasioned by the Interposition of the Earth, is now vanished; the Stars in our Firmament are now full of Light; the Light of our Moon is become like the Light of the Sun; and the Light of our Sun is Sevenfold. A Man that sees the River of Thames at a high Water, and observes how much it sinks in a few Hours, would think it running quite away; but, by the secret Providence of GOD, we see that when the Ebb is at the lowest, the Tide of a rising Water is nearest the Return. Your Majesty was likewise graciously pleased to speak something to us on Your own Behalf; and did vouchsase to say, You would ask something for Yourself; withal declaring some Uneasiness in Your Condition, by reason of some crying Debts which daily called for Satisfaction. Great Sir, I am not able to express, at the Hearing of those Words, with what a Sympathy the whole Body of the Parliament was presently affected. The Circulation of the Blood, of which our Naturalists do tell us, was never so sensibly demonstrated as by this Experiment. Before Your Majesty's Words were all fallen from Your Lips, You might have seen us blush: All our Blood came into our Faces; from thence it hasted down without Obstruction to every Part of the Body; and, after a due Consulting of the several Parts, it was found necessary to breathe a Vein. We cannot forget how much our Treasure hath been exhausted; but we remember also, 'twas by usurping and tyrannical Powers; and therefore we are easily persuaded to be at some more Expence to keep them out. The Merchant tells us, 'tis good Policy, in a troubled Sea, to lose some Part of our Cargo, thereby to save the rest. With Your Majesty's Leave, we have been bold to look into the present State of Affairs; and find those great Sums that have been heretofore advanced upon us were raised most of them in bad Times, and for ill Purposes, to keep Your Majesty out of this Your Native Kingdom; and when Your Majesty returned Home from Your long Banishment, You found the Naval Storehouse unfurnished, which will not easily be supplied. The unsettled Humours, and unquiet Spirits, that are amongst us, do necessitate a costly Guard for Your Royal Person: The Honourable Accessions of Dunkirk, Tangier, and Jamaica, do at present require a great Supply; but, we have Reason to believe, in Time to come, will repay this Nation their Principal with good Interest. Your Majesty hath sent a Royal Fleet upon a happy Errand, to bring Your Royal Confort hither: And is there any Englishman will stick to pay the Wages of those Mariners, whose Ships do bring so good a Freight? Upon all these Considerations, Your loyal Commons were in Pain, until, like prudent and good Husbands, they had redeemed the Nation from all its Public Debts. And that Your Majesty may at once have a full Measure of their Duty and Affection to Yourself, and that Your Neighbours Abroad, as well as the discontented Commonwealth's Men with all their complicated Interests here at Home, may see the happy Correspondence that is between our Head and all the Members of this Body Politic; we have chearfully and unanimously given Your Majesty Twelve Hundred and Three Score Thousand Pounds; which Sum we desire may be levied in Eighteen Months, by Six Quarterly Payments, after the Rate of Seventy Thousand Pounds per Mensem, to begin the Five and Twentieth of this present December; in order whereunto, we humbly pray Your Majesty's Royal Assent unto this Bill." Then the Clerk of the Parliaments went to the Speaker, and received the Bill of Assessments of him, and brought it to the Table. "1. An Act for the well-governing and regulating Corporations." "2. An Act for Prevention of Vexations and Oppressions by Arrests, and Delays in Suits of Law." "3. An Act for granting to the King's Majesty Twelve Hundred and Threescore Thousand Pounds, to be assessed and levied by an Assessment of Seventy Thousand Pounds by the Month, for Eighteen Months." The Royal Assent to this Bill was pronounced in these Words. "Le Roy, remerciant Ses bons Subjects, accepte leur Benevolence, et ainsi le veult." "4. An Act for confirming of an Act for restoring of the Marquis of Hertford to the Dukedom of Somersett." "5. An Act confirming an Act for Restitution of Thomas Earl of Arundell, Surrey, and Norfolke, to the Dignity and Title of Duke of Norfolke." "6. 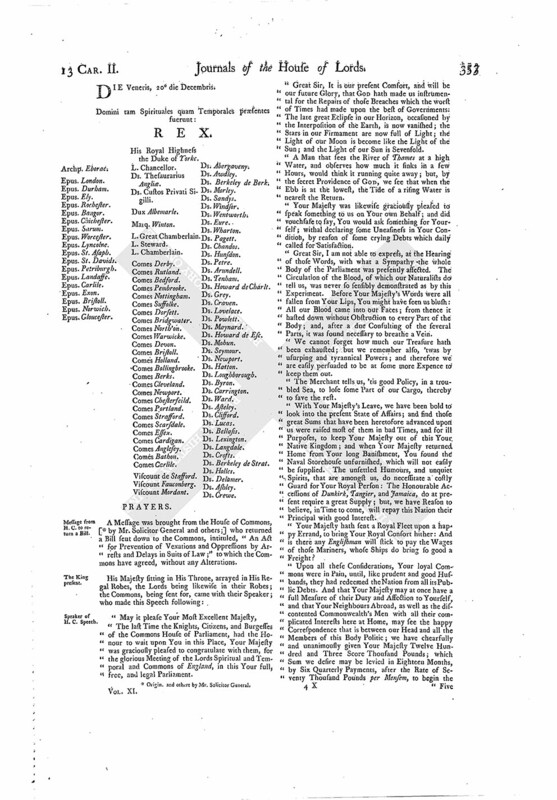 An Act to enable the King's Majesty to make Leases, Grants, and Copies of Offices, Lands, Tenements, and Hereditaments, Parcel of his Highness' Dutchy of Cornwall, or annexed to the same; and for Confirmation of Leases and Grants already made." "7. An Act for confirming Private Acts." "8. An Act for dividing Trynity Church, in Kingston upon Hull, from Hassle." "9. An Act for enabling Algernon Peyton, Doctor of Divinity, to make Sale of Part of his Lands, for Payment of Debts." "Soit fait come il est desiré." You have made Me this Day a very great and a very noble Present; a Present that I have received Benefit from already, before you presented it: For, trust Me, the Benefit is not small, which I and you both have already, from the Reputation of this Present, from the Alacrity and Affection you have so unanimously expressed in this Affair. I do thank you with all My Heart for it; and I will not enlarge those Thanks further, than by telling you, That I do not come more willingly this Day to pass this Bill, than I will do to pass any other Bills which you shall provide for the Ease, Benefit, and Security of My People; and I do verily believe that you and I shall never be deceived or disappointed in the Expectation we have of each other." After this, His Majesty withdrew, and the Commons went to their House. Dominus Cancellarius declaravit præsens Parliamentum adjournandum esse usque in diem Martis, videlicet, 7um diem Januarii proximi, 1661, hora decima Aurora, Dominis sic decernentibus. 1. Origin. and others by Mr. Solicitor General.